I serve as Texas SARE Model State Program Assistant. 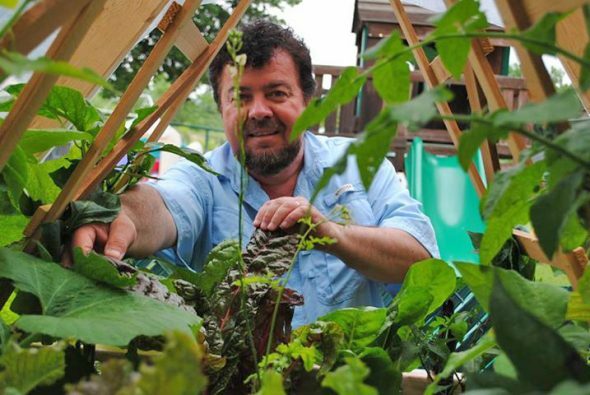 I like the module for Sustainable Food production John Musser has developed. The nitrate enriched fish water provides an excellent nutrient source for the raised bed vegetable production or hydroponic lettuce. A complete meal of protein and nutrient enriched vegetables can be produced through the module. Additional testing should reveal the variety of applications for the module and the uniqueness of this design. I am writing to commend John Musser for his outstanding pioneering work developing a sustainability project that is transferable to any culture in the world. His holistic approach involves teaching community leaders how to create an inexpensive, organic, aquaponic tilapia farm. The farm produces enough fish, vegetables, and fruit to feed a substantial number of people, and the farming method is entirely organic so it enriches rather than depletes the environment. Mr. Musser’s method incarnates the old proverb about teaching a village to fish instead of giving them fish. He is helping hurting and hungry people around the world. Mr. Musser is assisting me as I develop communities in areas of urban poverty in the U.S. We plan to implement his method in some of our communities. I am deeply grateful for the spirit, vision, and compassion of my colleague John Musser. He is so very deserving of financial support from the rest of us as he carries out his powerful mission. I have observed John Musser’s Aqua Farm System with great interest. It holds great potential for hurting people around the world. I am eager to share it with our overseas partners to help them in economic development strategies. One of our associates has taken the case statement to Ethiopia to be shared with 20 denominations. Many others are very excited about the Cycle of life Aqua Farm system. “I have heard about this Tilapia project from Jerry in Addis Ababa. When I heard this, my heart jumped with a great hope for Ethiopian people, and after I came back to Hawassa, I shared about tilapia to my colleagues and General secretary and they became very happy. From that day till now we want to bring this kind of development in our country. Howard has coordinated humanitarian outreaches in Ethiopia for 20 years. The Trinity Valley Beekeepers of Dallas, Texas had the privilege of hosting a guest beekeeper from Iraq on Friday May 22, 2009: Mr. Qassim Mudhaffer, from Baghdad in Iraq. He contacted us through our website, www.tvbees.org, during a visit he made to the US in May of 2009. He is the president of the Iraqi Beekeepers Association which was founded in 1991 after the second Gulf War. By 2003 the number of beekeepers involved had grown to about 770; the majority of them based in Baghdad. The current conflict in Iraq, especially as the war has hit Baghdad, has greatly reduced their operations. Mr. Mudhaffer is active in rebuilding this sector of agriculture in their country. Since 1969 he has worked in the agricultural sector in imports and sales of products and goods for agribusiness. He began selling beekeeping supplies in 1972. He has also been an active member of the Baghdad Chamber of Commerce since 1993. We put together a tour of some beekeeping operations in the Dallas area for Qassim Mudhaffer while he was here. Our first stop was to see John Talbert of Sabine Creek Honey Farm and get a tour of his operation. They were busy preparing supers for honey when we were there. We were invited to set up our system for poor farmers in Iraq.